For some reason released weeks earlier than expected . Anyway, I can not see these being as successful as the penguin series. Also I do not understand at all why 3 of the 4 coins in the series feature primates that do not live in Gibraltar (Chimpanzee, Red Colobus and Badoon). It’s too photographic for my liking. Colour on coins is one thing - and I’m not too fussed about that - but photographs just seem wrong to me. I can google a photo of a Barbary ape if I want to. 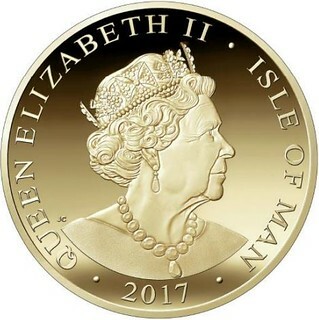 On a coin I want to see an artist’s work. It should be about making something purely out of metal. Colour and photos are cheating. 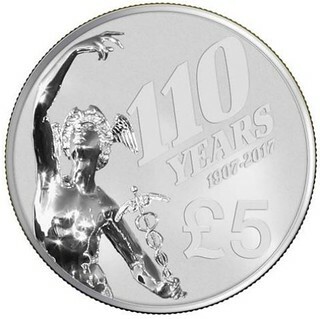 To raise a related subject, I'm quite annoyed with the way in which mints have illustrated their coins in recent years. The images above are typical. Those coins do not look natural at all. The images seem to be halfway between artwork and heavily edited or poorly lit photos. Why do mints do that these days? I much prefer the realistic photos of earlier days. It's more proof that we're living in the Matrix. No wonder poor Elon Musk is wondering whether he's a real boy and trying to escape the Matrix. We might as well all join the Pinocchio club. 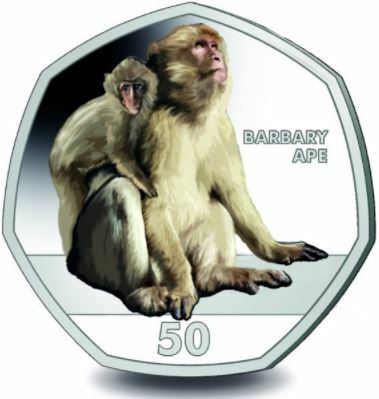 Over 50% of the total mintage of the Barbary macaque 50p coin has now been sold. 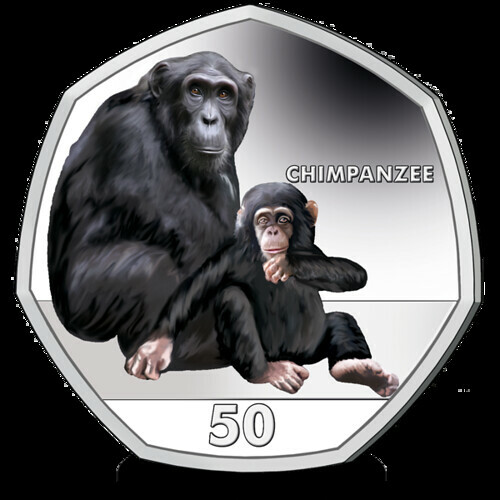 Pobjoy Mint has decided that no uncoloured coins will be minted of the primates 50p series. The image of the Chimpanzee coin which is the second issue in the Primates 50p series of Gibraltar. Pobjoy Mint will release it this Friday. Image copyright: Pobjoy Mint - Exclusive on World of Coins Forum. Despite my reservations about photographic designs on coins, I did actually succumb to this. The folder is quite nice and it’s quite fun collecting coins in a series rather than having them all at once. The remaining designs are the baboon and the red colobus. All four are native to Africa but only the Barbary ape can be found on Gibraltar (which isn’t too surprising as it’s such a small territory). 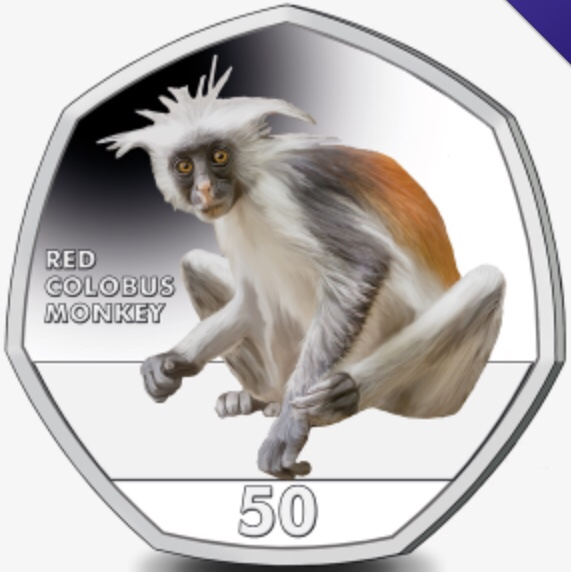 The third coin in the series, the Red Colobus, is available to pre-order. Pobjoy Mint really have whizzed through this series. 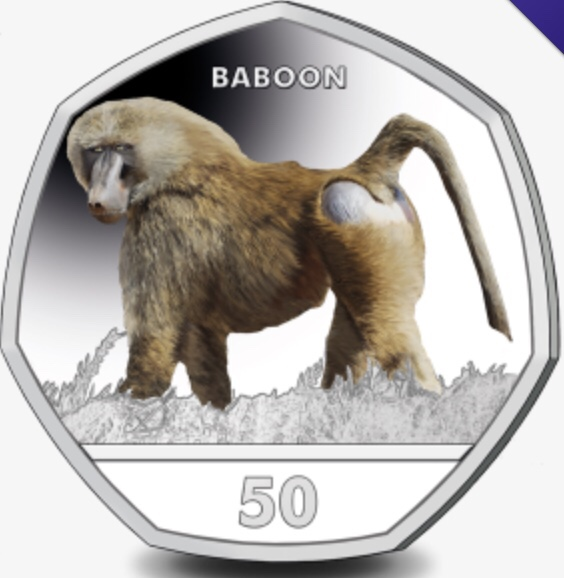 The final coin, the Baboon, is now available. Pobjoy Mint really have whizzed through this series.